Joseph Gordon-Levitt is on a roll this year. Really good performances in The Dark Knight Rises, Premium Rush, and now in Looper. Time travel hasn’t been invented yet. But it will be several decades from now. In that time, it’ll be outlawed and only used in secret by the mafia to facilitate murder. Outright murder is nearly impossible in the future because of technological advances so when gangs want someone dead, they grab the person and send him (or her) back into the past, where a waiting assassin called a looper will kill him and dispose of the body. To get rid of all links and evidence to crimes, sometimes the mafia will send back the looper’s future self to be killed by his younger self – “closing the loop”; a sort of bizarre suicide that’s in the looper’s contract. 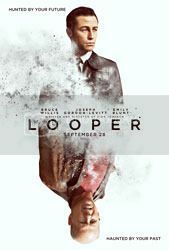 Joe (Joseph Gordon-Levitt) is a looper for a gang in Kansas, and one day he finds himself confronted by his older self (Bruce Willis)… an older self that’s quite unwilling to die easily and has an agenda of his own. I think the best science fiction stories are the ones which do two things: (1) present a solid “scientific” concept, with principles that govern the concept(s) in the story, and (2) remain relatable and make you think. And when I say “make you think”, I don’t mean that it makes you reflect on the intricacies of the scientific concepts presented or anything. It could just be a simple reminder of truths that we already know, or of the complexities of human emotions. E.T. sends a message about friendship, Inception was about a man desperate to get back to his children, Back to the Future posed questions about how one’s actions can change the future, and Star Wars is an exploration of a society that spans the universe, substituting planets for countries. Just to take a couple of literary examples – Isaac Asimov’s short stories turn robot psychology into a reflection of human psychology, and C.S. Lewis’ Space trilogy is based on the idea that God did create life on other planets as well as Earth. The combination of science and the emotional/psychological element is what makes good sci-fi. But I enjoyed the movie as a whole. It moved at a good pace, built up suspense well, had appropriate breaks in action without losing the flow, and featured good performances all round from everyone. The ending is probably what really made it for me. I’d heard that the ending was rather unexpected – and it is, kinda. It’s an ending that I kind of saw coming… but at the same time, I didn’t really think they’d actually end it that way. A bittersweet ending that works. I love happy endings, but sometimes the not-so-happy one is the best endings for the story.